Foreword: Before I begin, it must be generally understood that Mother saved everything. And while I have always encouraged that, this experience is already challenging my beliefs and making me realize how much attention my things will receive after my death. 1) Laura had a very long day yesterday, and I had a night of no sleep. I decided to get the day going about 5:30 AM - very much like Mamma, actually. She told me once she just didn’t see the point in lying around in bed if you were awake. 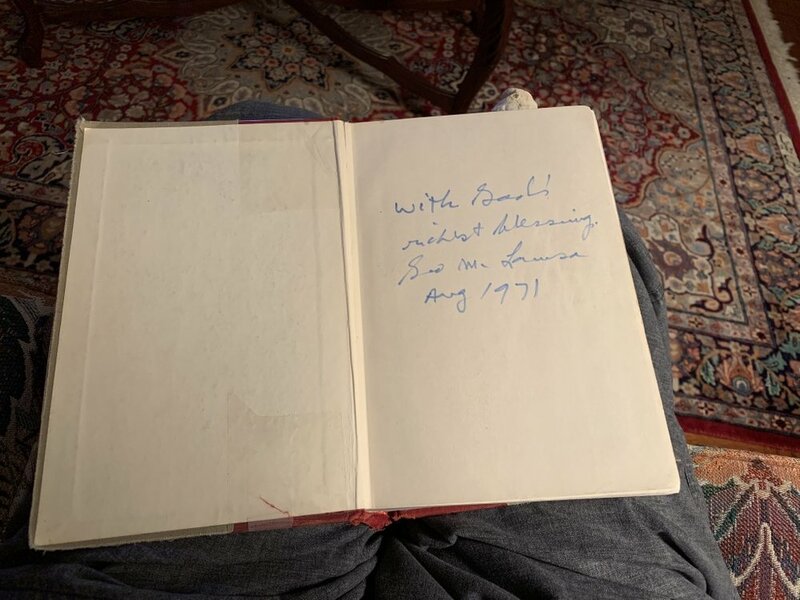 3) I turned to the first page, and was surprised to see an autograph: “With God’s richest blessing. Geo. M. Lamsa Aug 1971.” My goodness, it’s the Lamsa Bible! Then August, 1971, must have been the first of our weeklong summer retreats at Unity, when I remember well that we heard George Lamsa speak and heard about his life story. I spent the rest of devotional researching ye Intyrnytte for more information about him and this controversial translation. 3a) You know the entire trip is going to be like this. An object, most likely a familiar one, will reveal something unexpected that will start a chain of memories. 4) And in fact, the entire morning was like that. Laura and I decided to start with the guest room closet. What remained inside was mostly boxes from Gramma and Uncle Bill’s house, but what came to us first was all Mother’s boxes of vacation materials. My goodness! We threw away SO many tourist brochures from all over the world, from Hawaii to Copenhagen. Postcards were saved for a friend of Laura’s. Laura kept most of the photos. Coins (Mother loved to bring back examples of local currency) were collected together. 4a) Mother saved everything, including posters from my unhappy campaigns for student council in junior high school. Laura said she found them in the attic, and one has to wonder why Mother would have brought them over here from Orchid Street. I certainly didn’t ask her to preserve them. 5) My brother-in-law showed up earlier than expected with a piece of furniture that’s coming to Boston, and he joined us for a time before getting active with lawn care. I had a bottle of top-notch bourbon for him as a thank-you gift. 6) Back in the guest room, I had two “Oh my GOD!” moments (I no longer remember in what order). In one box I found a long necktie box with a small ring box inside, and I knew instantly that these were the boxes that Daddy has used to surprise Mother with an egagement ring Christmas Eve, 1954 - and thereby announce their engagement to his family. 7) At the top of the closet I saw a large box marked FRAGILE and I was pretty sure what it was. And I was right: it was my Mad Hatter hat that Mother made for me out of papier maché - her greatest achievement! But ALSO in the box was something I thought had been lost forever: a Mexican tin shrine to hang on the wall that I had been given in the late 1970s from cousin Delphine’s things. 7a) Even better than those things, a small white jewelry box yielded a cherished memento I thought, too, was lost forever. 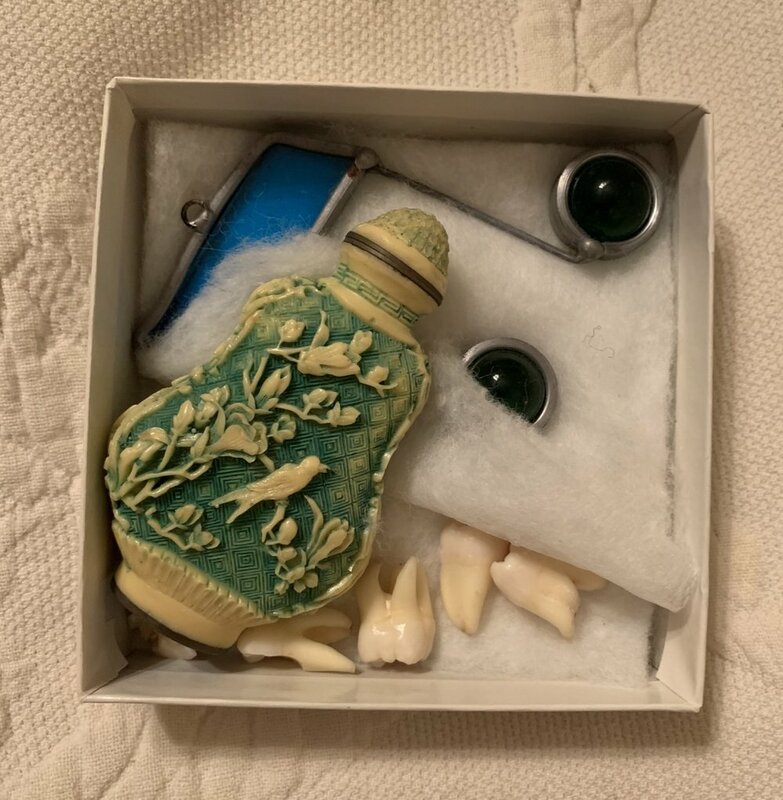 Along with my wisdom teeth and a glass suncatcher rested a green-tinted ivory snuff bottle. That little bottle was given to me by Miss Emma, a very elderly lady to whom I was very devoted in my early teens. Miss Emma, the strongest pillar of cultural Lake Charles and a friend and neighbor of Gramma, she gave me that little bottle the day she moved to the nursing home in Texas. I was the only one who came to say goodbye when they drove off in the ambulance, and I remember flopping down in a big armchair and crying the rest of the morning. And now this memento is restored to me. 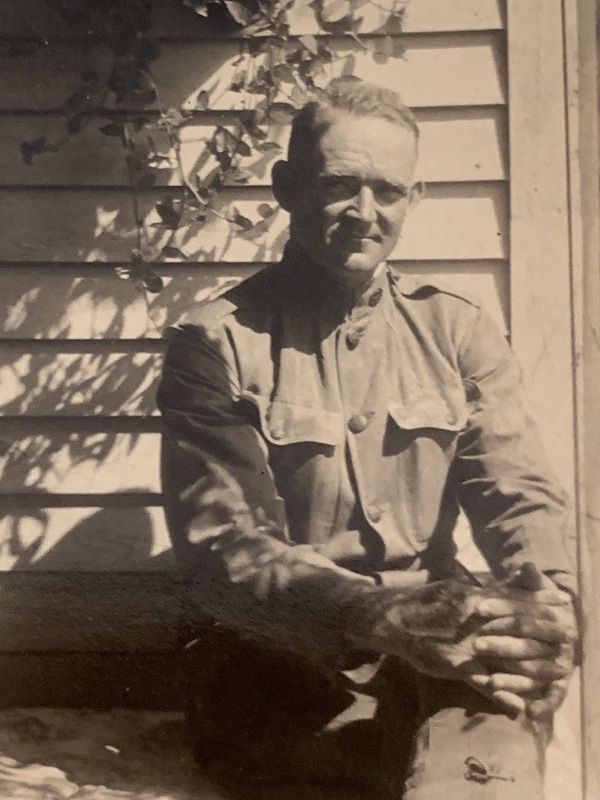 8) We found a WWI photo of Grampa Dimmick neither of us had seen before. No wonder Granny knew she’d marry him as soon as she saw him walking up the walk at the home of whoever it was she was visiting in Opelousas. 10) After dropping off about six boxes of books in a couple places, we divided to conquer for the afternoon. Laura wrapped up crystal, and I started boxing up papers from the morning search that will come to Boston with me. So many wonderful photographs, and so much else! The engraving plates from their wedding invitation, their high school graduation invitation and programs, a lot and a lot. 10a) I know you are all saying “Robert, just torch it all!” And you know I just cannot do that, but I am not taking everything, and I am proud of the amount of stuff that is getting tossed out. 10b) But OH . . . there is so much. I have almost every one of Mother’s date books from 2014 back to at least 1971, and probably longer. These aren’t just her appointments, but a guide to what everyone in the family, friends, and church was up to, including obituary clippings, wedding announcements, and sometimes recipes. What am I going to do? If there was a Museum of the Middle Class, these would be the cornerstone documents. 11) Tony expressed interest in early dinner, and we headed off to a new place, Rikenjames, on Ryan Street, that was quite good. We were obviously beating the Friday rush! Beer and catfish for Tony, beer and steak for me. 12) I was dropped back at home while Laura and Tony went to meet local friends. And I was able to discover a box of Mother’s college things. This included not only her diploma and three of four athletic association passes, but also a small box of everything related to Rush her freshman year - including cocktail napkins from the various functions! At last, proof that Mother’s lifelong love of napkins and making sure everyone had one began before marriage! :-) But even more fun, she’d saved all the nametags. 13) I’m gonna have to pick up my pace tomorrow, which will also include seeing Mother’s friends.